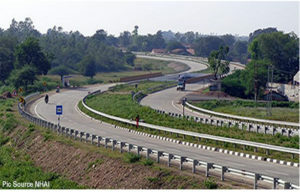 National Highways Authority of India (NHAI) set to roll out an ‘incident management system’. Under the system, ambulances will be positioned every 50kms to be able to respond to any accident within 15 minutes of it being informed on a national accident helpline. The first phase will be rolled out in December this year, which will target the national highways of Tamil Nadu, Delhi, Rajasthan, Uttar Pradesh, Haryana, Gujarat and Maharashtra. The system will be implemented on all the highway stretches later. A larger four-bedded ambulance with medical recovery systems will save lives within the ‘golden hour’ will be placed every 100 km in seven states to begin with. The NHAI plans to invite bids for running the ambulance service on highways from manufacturers of specialised vehicles, hospitals and emergency response service providers by the end of August. The NHAI has also mooted the inclusion of CNG fuel stations in the wayside amenities along all highways. A CNG fuel stations will come up on highways, as part of a proposal now under discussion between the Ministries of Road Transport and Highways, as well as Petroleum and Natural Gas.